Holy bagumba! I'm thankful Margie Myers-Culver told me to stop what I was doing to watch the book trailer for Dan Santat's The Adventures of Beekle: The Unimaginary Friend. OK, I need to run to celebrate World Read Aloud Day with a first-grade class. Happy watching! Happy connecting! Happy reading! Thank you, Dan and Margie! 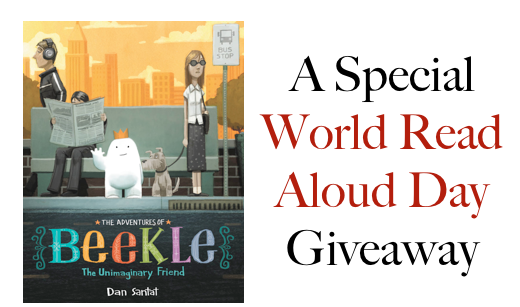 I am giving away one copy of Dan Santat's The Adventures of Beekle: The Unimaginary Friend. 1. It will end tonight at 11:59. The Adventures of Beekle: The Unimaginary Friend will be released on April 8. Thanks for the opportunity! The music sounds like the soundtrack of "LOST". Oh, how I miss that show! Great book trailer. I think I need Beekle. This is a beautiful book. Have to say, though, the Life and Death theme from LOST probably helped me to like it even more.